The head ornamentation of a Kaiju looks downright tame next to that of a shield bug. Pacific Rim concept art includes our best look at the giant monsters! Photographer Francis Prior calls this gorgeous macro image "Surface of Mars," no doubt in reference to the borderline-geological – and totally otherworldly – appearance of its subject's striking head morphology. The textures on the head of this stink bug, brought into sharp focus through a process known as "stacking," are so diverse as to be almost unbelievable. But then, Prior tells us, that's kind of the point. 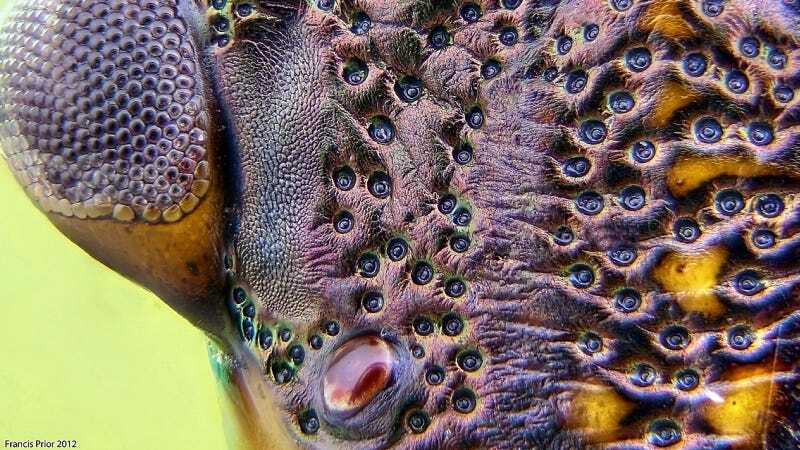 "What is so great about all Macro photography is we see things we could not normally [see] or may not want to see," he tells io9. "[And] what we can't see, we can't appreciate, right?" Prior says he's unsure what purpose these features serve, though University of Machester zoologist Matthew Cobb suspects they might might be involved in chemoreception. Prior says he's observed similar patterns on other beetles, as well. Any entomologists out there have any light to shed on the matter? For more of Prior's outstanding work, check out his facebook and visit his flickr page. Hard to believe he's only been shooting insects for two years.